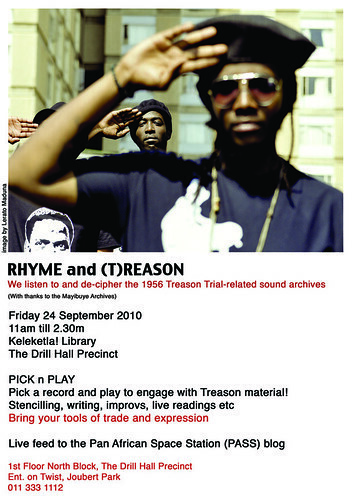 Rhyme & (T)Reason is a Heritage Day acknowledgment that uses the arts to engage with archival material related to the 1956 Treason Trial with specific reference to the Drill Hall site. This is an event hosted by Keleketla in downtown Johannesburg. The use of the audio visual arts and conversation/discussion around themes of Heritage will engage the audience in situ as well as tap into the ‘stream of consciousness’ for the radio audience. Keleketla will connect live with PASS Radio at 11pm tonight.